Hi Ladies!! This is an exciting post. 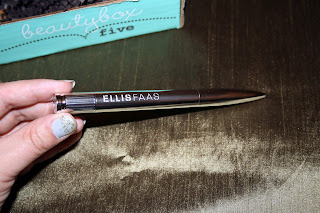 This month's Beauty Box 5 was AMAZING. 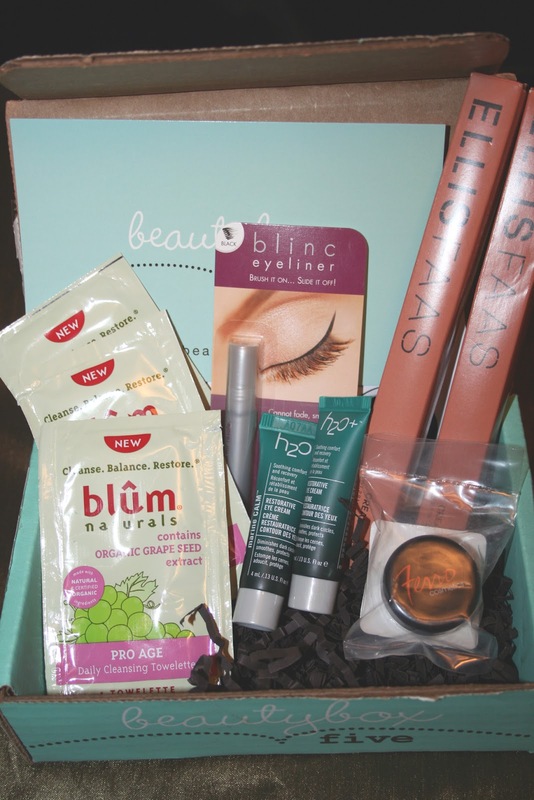 It seems that all of the Canadian Beauty's received an identical box. This leads me to believe, they want to cancel Canadian services or increase our prices due to shipping. I hope I'm just being paranoid...but seriously, we got an awesome box! 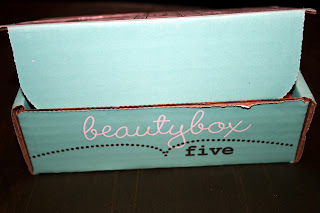 Here is the box...Tiffany blue. The smallest of all packages, but crammed tight! 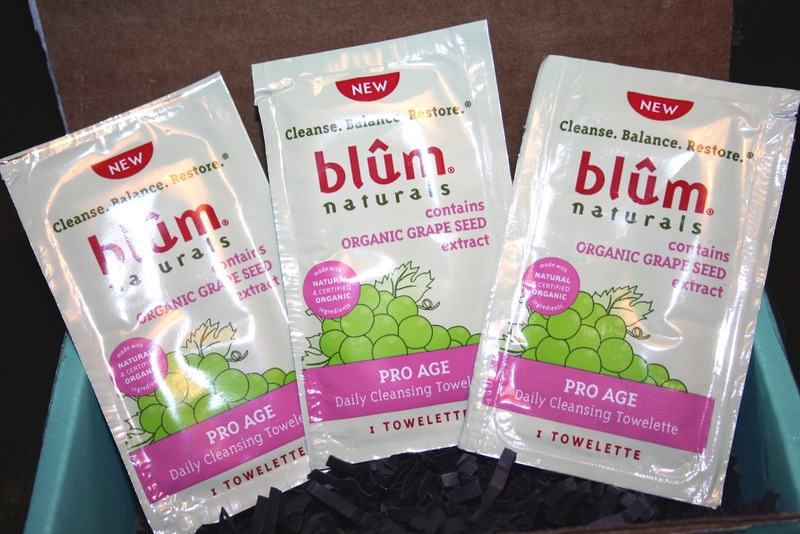 First, Blum Naturals Makeup Remover Towelettes. It's nice that they're listening and including more when they are little sample packets. These towelettes actually have a nice heft to them... they seem large/thick. This is a natural product, which is cool...we'll see how natural makeup removers holdup! Full size is $3.99 for a 10 pack. Sample size is 3 towelettes valued at $1.20. 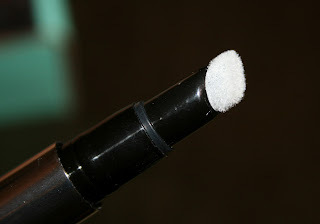 Next, is a blinc eyeliner. I think this may have come in a previous box, but that's okay. I also picked up a full size one at the Glymm sale...without even testing... *sigh* I hope it's decent! I think the concept of the product is neat. It can only be removed by combining water and pressure. Full size is $26 for .21 oz. Sample size is .02 oz valued at $2.48. 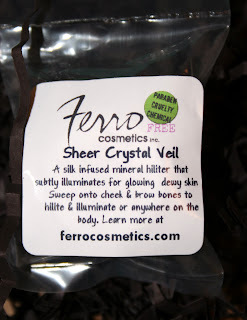 Next is a Ferro Cosmetics Veil. I've never tried a veil, so I'm super excited to try it. 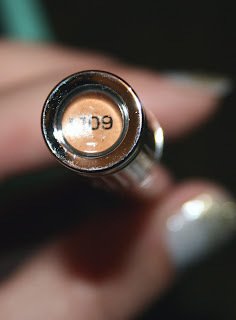 It's meant for illuminating the skin. It's a white powder and it's intended to be used over your foundation or mixed with your moisturizer for a dewy soft finish without shimmer or glitter. Full size is $19 for .14 oz. Sample size is ? I'm not even going to guess. It's not very big. If you click on the picture you can read the info here. 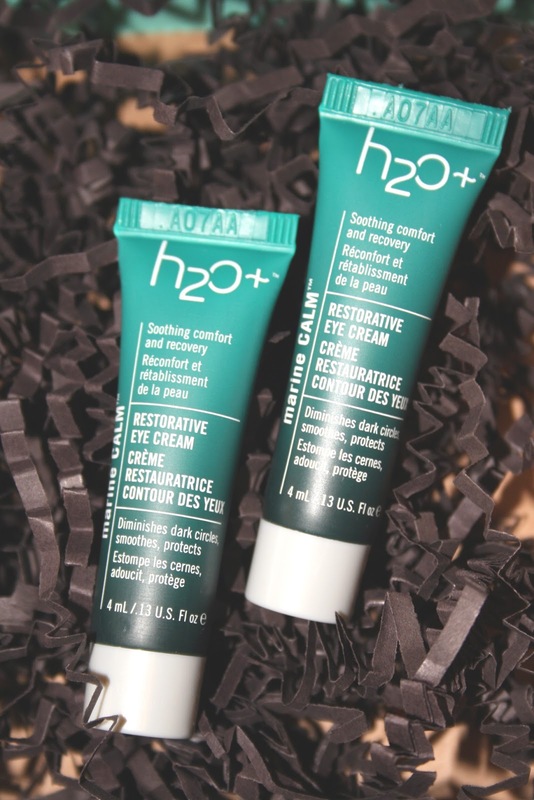 Paraben/Cruelty/Chemical Free! 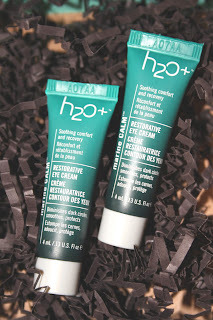 Next is H2O+ Marine Calm Restorative Eye Cream. It helps diminish dark circles, smoothes and protects. 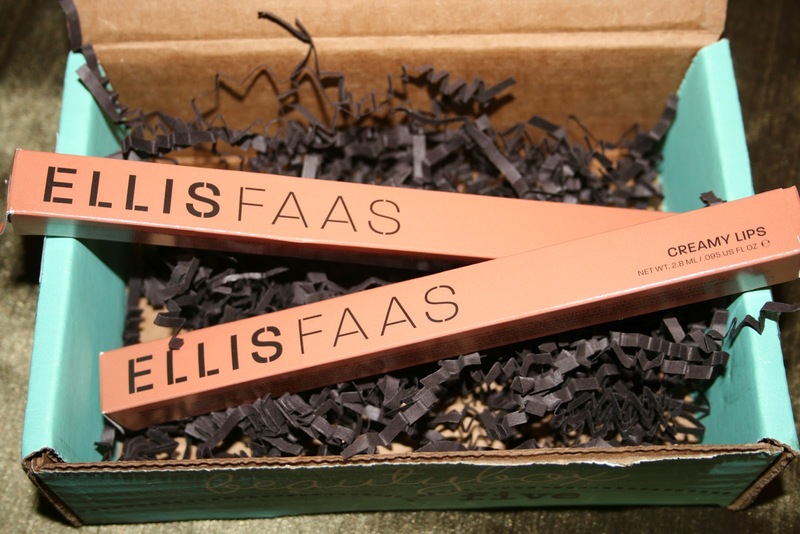 I'm looking forward to trying this product...I have notorious black circles and have yet found anything to wow me. I'm super excited they sent me two...I know that not everyone did. Full size is $32 for .5fl oz. Sample size is .13fl oz. I received 2 for a value of almost $16. Finally, the most shocking part! 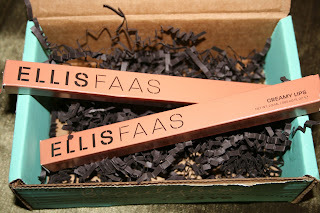 I received 2 Eliis Faas Creamy Lip Glaze. My first thought was that I got two different products...such as a mascara and a liner or something. I wasn't sure what the product was at first. Then, when I saw it was a lip colour, I thought maybe they were two colours. But, alas they were the same. So, I immediately thought this was a mistake. 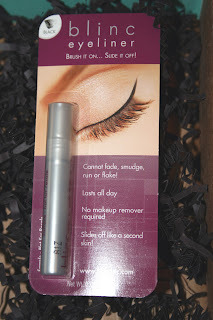 I searched for other reviews of the August box and concluded it was a mistake...until I saw Jayne at Cosmetic Proof also recieved a double..and upon further inspection..most Canadians did. Should we be worried Canadian gals? 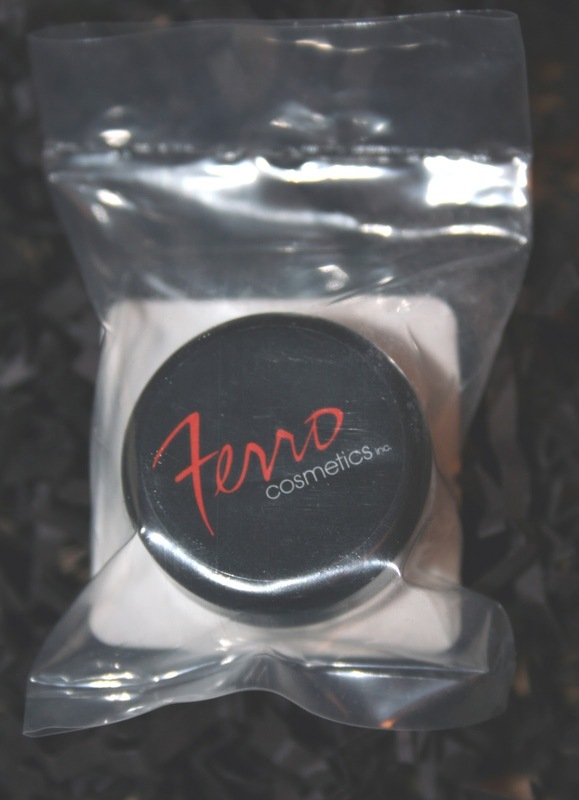 This is a full size product valued at $35 for .95 oz. X2 = $70! I couldn't get a great picture of the colour. It doesn't look this butterscotchy, it's more of a neutral colour. The tip is something like I've never seen before. It's a thick piece of velvety like foam. You click the pen to dispense the product, which I haven't done yet. This is my whole box!! Wow!!! Total value: $93!! (approximate) That's insane! 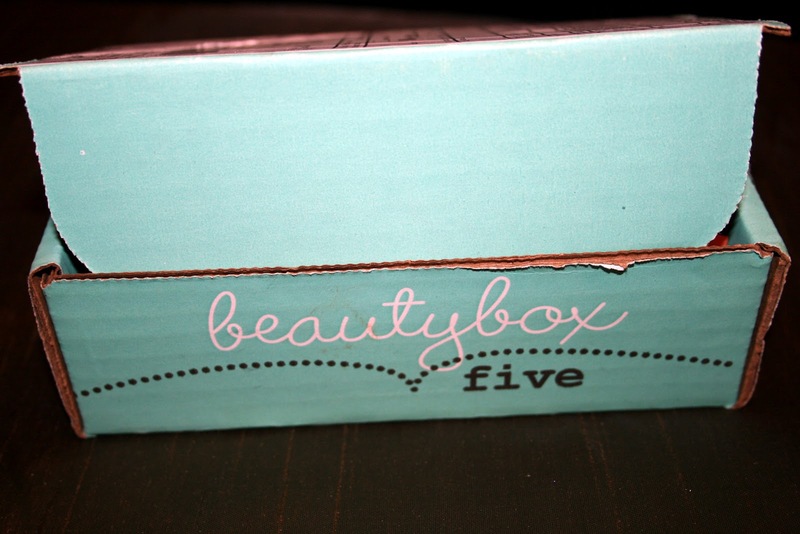 I totally loved this box. I know this isn't the norm...so I can't expect the same next month...but it sure was a treat. I pay $12 US for this box, I believe. Did you get one? What did you think? What are you looking forward to trying? It is a really nice product! Sadly, the colour just didn't work for me! Quite a lot of us received doubles! One blogger I saw received two different lip colours which would have been nice since they are so expensive to buy on their own. I feel paranoid too...I feel like the universe is going to make us pay for having such a great box for August! Ohhh man, two different colours would have been nice. This colour didn't end up working for me, so what a bummer! Hey, I guess we were right that the universe was going to make us pay..this months box was a bit sad! Fair Ivy - A Prize!